A beautifully kept modern home with sunny balcony and access to large communal roof terrace in a great neighbourhood with easy access to the heart of London and fantastic transport links across the city. Luxurious and comfortable, it's perfect for couples and families visiting London or those popping in and out of the city on business. The apartment is your own. Cleaned professionally with fresh luxury linens, it's prepared for each new visitor. My friends at Hostmaker are looking after my home while I am away. I trust them to give you a warm welcome! Hostmaker will look after you. If you have any questions about your stay, please get in touch. Our area is the perfect balance between city and neighbourhood. While you're only 3 minutes out from Bank and 10 from Canary Wharf, you're also just a short distance to the lively nightlife and restaurants of Shoreditch and the beautiful neighbourhood of Wapping, which is right along the river. Meanwhile right downstairs is a large daily fruit and vegetable market, a local baker and butcher, and a number of small shops. The apartment is really well located for public transport. Located 1 min walk from Shadwell DLR and Shadwell Overground stations. 10 mins to Canary Wharf station, 2 mins to Bank station. 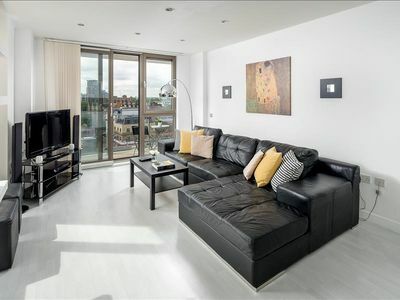 From the Overground station, Shoreditch is 2 stops away or a 20 min walk. Also a lot of local buses can get you around London really easily and bus stops are within 1 min walk. A great local tip is to download the Citymapper app. This free app will plan your journey for you efficiently and quickly. It gives you a variety of different transport options such as bike, rail, tube and Uber taxi. It will also take you step by step through your journey as you travel and notify you when you are nearing your destination.